Hundreds of grieving cops, family, and neighbors held a candle light vigil at the 46th Precinct in the Bronx borough of New York City Saturday night in memory of assassinated wife, mother of three and NYPD Officer, Miosotis Familia. Familia was ambushed and shot the head as she sat in a police vehicle early Wednesday by a cop-hating felon, Alexander Bonds, who was shot dead by officers responding to what amounts to an assassination. Sadly, one official not at the vigil was Officer Familia’s ultimate commander, New York City Mayor Bill de Blasio. 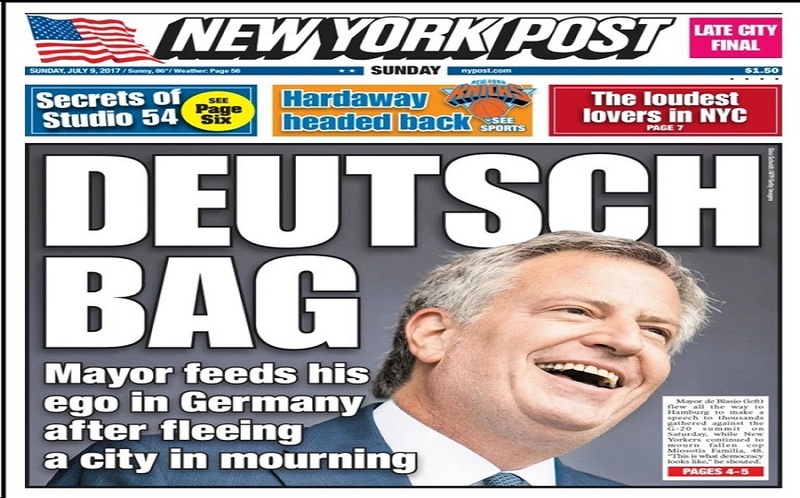 De Blasio obviously believed going to Germany to deliver a speech and protest against President Donald Trump with radicals, many of whom were bought and paid for by multi-billionaire George Soros and other anti-American, anti-capitalist is more important than mourning the death of an American hero with his constituents. 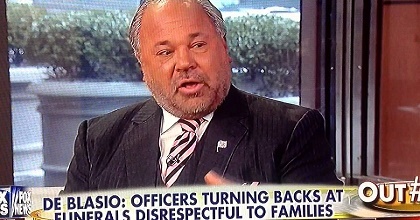 Former NYPD Det. Bo Deitl, who appears frequently on Fox News, nicknamed Mayor de Blasio “Big Bird,” the famous Sesame Street character. Conservative Base reported on Wednesday that New York City Police Officer Miosotis Familia was assassinated while sitting in her patrol car in the Bronx on Wednesday morning. “Officer Familia was murdered for her uniform and for the responsibility she embraced,” NYPD Commissioner James O’Neill said during a press conference. Instead of emphasizing the seriousness of killing police officers, Mayor de Blasio flew first-class — police bodyguards and all — to Hamburg, Germany to deliver his keynote address to rioters, looters and protesters against capitalism and as well as seeking to sabotage the G-20 Summit of world leaders including President Trump convening there. The slain officer, 48-year-old Familia, was a 12-year veteran of the Big Apple’s police force. She was assigned to the 46th Precinct, in the Bronx. “Two cops gunned down Familia’s alleged assailant during an exchange of fire after he blasted the mobile command post parked near E. 183rd St. and Creston Ave. around 12:30 a.m.,” according to Police Commissioner James O’Neill. O’Neill also noted that the suspect Alexander Bonds, a parolee, was killed when the two cops fired back, but an innocent bystander was also wounded in the crossfire. Warren Wilhelm, Jr., aka, Bill DeBlasio, is a long-time, radical communist revolutionary. Look it up. He’s out to overthrow the government of the United State, by any means necessary. He should be arrested for sedition or treason and dealt with according to what the law prescribes. Oh… and do you think the fact that he is a powerful member of the Democrat Party is a mere coincidence?